Are women and minorities treated fairly? Charges of gender and racial bias and sexual stereotyping continue to plague the film and broadcast entertainment industries despite decades of complaints from women, minorities and civil rights advocates. White males still dominate virtually all aspects of the business, from writers, directors and producers to actors starring in leading roles. 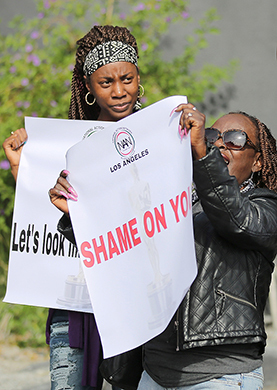 But the movie industry may have reached a tipping point this year following a controversy over the Academy Awards nominations for best actor and actress: For the second consecutive year, all the nominees were white. Television, meanwhile, is becoming somewhat more inclusive than movies, as are emerging internet-based shows. Still, the Equal Employment Opportunity Commission is investigating claims of bias against female directors, and many minorities remain unpersuaded by recent Hollywood diversity initiatives. Skeptics say significant industry change is unlikely, especially in the high-cost, high-risk movie business, where box-office favorites rather than untested newcomers typically determine which films receive financing.